The Med-Tek range was developed by G.Low (Glow) who has spent over two decades researching the mineral nutrition requirements of Med. During this time Glow has worked with numerous experts in the field and in more recent times he has been able to access tissue testing and other facilities/labs in the U.S. to cross-reference deemed to be Med nutrition optimums against growth rates in side-by-side trials. Additionally, quality parameters have been carefully monitored through essential oil profile testing. Based on this research, the Med-Tek range has been developed with both yield and quality parameters in mind. As we are launching Med-Tek Nutrients in Australia we have focused initially on coconut coir specific nutrients and additives. Australia is, after all, a coco nation with an estimated 85 – 90%, or more, of Australian hobbyist hydroponic growers producing in coir. You will find that we offer a limited range of additives to go with our coir base nutrients. A root stimulant, plant metabolism booster (Rhizo Plus), a Cal-Mag and microelement additive (Cal Mag Micro), a silica product (Super Silica), a PK resin elicitor/biostimulant (PK Elicit) and an organic biostimulant, bloom booster and quality enhancer (Connoisseur Blooms). Other than this, we offer a flushing agent that, in fact, really contains two separate potent elicitor molecules which further act to enhance the overall quality of the crop. This lineup is true to our philosophy that it doesn’t take dozens of additives to achieve the best possible results. For example, some manufacturers have multiple additives on their nutrient charts/calendars, all of which they claim should be used in conjunction with each other in order to realize optimum yields. However, all we can say about this is that any manufacturer who claims it takes multiple additives along with their base nutrients to achieve optimum yields is either making/supplying an extremely sub par base nutrient or they are leading growers up the garden path. The fact is, optimum yields are achieved through an optimized growing environment (temperature, RH, light quality and quantity, CO2 levels, and an ideal root zone environment re oxygen and moisture ratio) along with ideal plant nutrition. On the latter (“ideal plant nutrition”) a solid base nutrient with a PK tweak during bloom, along with some silica, pretty much covers all bases from a plant nutritional perspective. Other than this, tissue analysis shows the Cal-Mag requirement of the crop tends to peak for about a week during mid-bloom. For this reason, some additional Cal-Mag (beyond what many base nutrients supply) at about week 4, dependent on genetics, of flower can be beneficial to growth rates. In fact, what it comes down to (the science beyond the hype) is maximum crop production – both in quantity and quality – is primarily a function of environmental conditions and genetic potential. The extent to which this limit can be reached relies directly on the degree and effectiveness of practices which serve to optimize the plant’s environment. Where plant nutrition is concerned, plants require a wide range of nutrient ions to support growth. Each of these specific nutrient ions has an ionic sufficiency range in which growth is optimized. The uptake and utilization of nutrients depend not only on the quantities but also on the ratios among nutrient types. If a particular nutrient is deficient, yields can be negatively impacted. A similar reduction in plant growth can arise when a particular nutrient is present at a concentration that is too high. All the nutrient ion types need to be within their respective ranges if plant productivity is to be optimized. Departure from these optimal levels in any of the nutrient ion types will have an influence on all the others as well. In many cases where we look at commercial base nutrient and additive formulas, through lab analysis, we find that given their nutrient levels and ratios, the nutrient profile in solution that results, based on the manufacturer’s usage rate recommendations, is nowhere near where it needs to be in order to ensure optimum plant health and growth rates. Other than this, some suppliers recommend such high nutrient strengths through their suggested ml per litre usage rates that this results in osmotic stress, reducing water and nutrient uptake which, in turn, results in lower than optimal quality and yields. It’s a bizarre situation and one that is presumably largely driven in an attempt by just some suppliers to make more sales to hydroponic consumers than need be. Thus, you will find that we take a very different approach – we sell less to give you more. Lastly, to explain our line; in recent times there has been a focus on maximizing essential oil production in medicinal crops. Studies have come up with some interesting, albeit, often contradictory findings surrounding the use of elicitors. Elicitors basically work though inducing a stress response in plants whereby the plant is, for lack of a better word, ‘tricked’ through the application of an elicitor into perceiving biotic and/or abiotic stress, and as a response the plant induces natural defence mechanisms which include producing higher levels of essential oils. However, it’s an extremely complex business and if not handled correctly there can be payoffs in growth where the plant directs energy away from growth, towards protecting itself. This is scientifically referred to as the ‘growth stress response payoff’. The net result of this growth stress response payoff is a reduction in yields. Therefore, the active/s used to elicit higher levels of essential oils must be selected and applied carefully. Certain manufacturers have discovered the benefits of elicitors in recent times. For example, Rock Resinator, Advanced Nutrients Bud Factor X and Botanicare Liquid Karma all contain (or contained) salicylic acid. Salicylic acid is a naturally occurring compound in plants. When a plant is stressed or attacked by a pathogen, this compound stimulates the plant’s internal defense pathways. Treating a plant with additional salicylic acid triggers the plant’s defense pathways in the same way. The end result is that the plant produces more oils to ward off a perceived stress or attack. However, salicylic acid also has the potential to create a growth stress response payoff where the plant directs energy away from growth and towards defense, and as a result applying salicylic acid under some circumstances has the potential to negatively impact on growth rates. For this reason, better options for elicitor molecules exist. For example, oligosaccharides have been found to act as triggers for activating defense pathways in the plant. Put very simply they sit at the crossroads of two key defense pathways – the jasmonic acid pathway and the salicylic acid pathway. This basically means that unlike elicitors such as salicylic acid, oligosaccharides do not induce a defense response in any one specific pathway but instead have the potential to induce a defense response through enhancing a battery of plant responses both locally and systemically. These include early signaling events as well as the accumulation of defense-related metabolites and proteins such as phytoalexins and PR-proteins. The benefit of this is that oligosaccharides improve plant health and promote higher levels of essential oil production; however, they are also shown to increase chlorophyll levels with a net gain in the rate of photosynthesis. This basically means that oligosaccharides act as both potent elicitors and growth stimulants at the same time. It’s heady stuff and from a plant physiology perspective the language of elicitors and plant defense pathways, in general, comes across as gobbly gook to the layman. I’ve, therefore, greatly simplified things into a language that hopefully helps us mere mortals understand some basics about how elicitors work. We actually supply three products which act to enhance quality in the crop. Firstly, there is PK Elicit which in the strictest terms doesn’t contain what are deemed to be elicitor molecules. Instead, PK Elicit contains phosphites, also referred to as Phi (H2PO3−), in conjunction with monobasic and dibasic phosphate ions (H2PO4– and HPO4-2). Phosphite is a bit of a hotly debated topic among academic circles as to exactly how it works, although what is less debated is that the application of phosphite offers benefits to growth, quality and plant health. In short, phosphite as a percentage of total P applied to crops has been widely shown to act as a biostimulant and improve crop yield and quality, as well as stimulate environmental stress responses. Therefore, phosphite acts as a biostimulant in plant growth. Secondly, PK Elicit contains low molecular weight organic acids and carbohydrates which are shown to improve nutrient absorption in hydroponics along with improving the plant’s rhizosphere through providing an energy source for microflora. Additionally, studies show that along with increased potassium and phosphorous during flower, plant demand for magnesium, sulphur, boron, iron and ammonium nitrogen also increases.Therefore, PK Elicit also contains these elements to ensure the nutrient demand of the crop is fully met. The end result is that by meeting the nutrient demand of the crop, achieving yield quality and quantity (genetic) potential is better facilitated for. Besides PK Elicit we also produce and supply Connoisseur Blooms. Connoisseur Blooms utilizes elicitor molecules through incorporating carefully selected low molecular weight oligosaccharides. These oligosaccharides act as biostimulants while also acting as a defence pathway catalyst in plants which results in higher levels of essential oil production. Connoisseur Blooms is actually a very sophisticated formulation which also incorporates other organic biostimulants and natural, organic plant growth regulators. These act to improve chlorophyll production, increasing the rate of photosynthesis, improving growth rates and reducing crop finishing times. Lastly, we supply Resin Finish which is used during the flush cycle to maximize resin production. 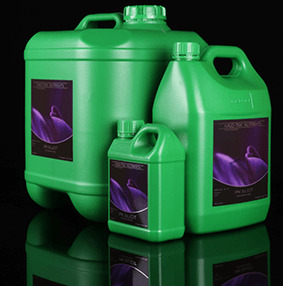 Resin Finish contains two potent elicitors which due to their dramatic effect in activating the defense pathways of the plant would be unsuitable for use at any other point of the crop cycle. The key to Resin Finish is that by the time you reach the flush cycle the plant isn’t producing more biomass (size) per se; therefore, a strong stress response can be invoked without compromising yields. The end result of applying Resin Finish is that the plant packs on oils in the last 7 – 14 days during the flush. With all other flushing agents, that we know of, this doesn’t occur. In fact, most flushing agents are just citric acid liquids, with perhaps a bit of glucose/dextrose thrown in, which do pretty much nothing to help a plant consume/deplete stored/accumulated nutrients in plant tissue. In other cases, you even find some flushing agents contain mineral nutrients (salts) which sort of defeats the argued to be benefits of flushing. In yet other cases (worst case scenario) you even have some suppliers adding EDTA empty chelates to their flushing agent. EDTA is quite toxic and is readily uptaken by the plant which is then consumed. Basically, any flushing agent that contains EDTA should be avoided because rather than arguably cleansing the product, it makes it more toxic. Besides this, it might surprise some to learn that once a plant has stored nutrients in its tissues (leaf, stem and bud matter), these nutrients can’t simply be made to miraculously disappear through running water only, or through running a flushing agent for 7 – 14 days or more (take your pick) before harvest. Resin Finish really isn’t a flushing agent in the traditional sense. Its purpose is to maximize crop quality by forcing the plant to think it is under abiotic and biotic stress in the latter stages of the crop cycle. As a result, the plant pumps out oils to defend itself against these perceived stresses. This means that through the use of PK Elicit, Connoisseur Blooms and Resin Finish there are three bloom cycle additives in the Med-Tek line that are geared towards ensuring the highest quality and quantity of end product that can be achieved where environmental parameters (temperature, RH, light quality and quantity, CO2 levels, and an ideal root zone environment re oxygen and moisture ratio) are in check. Jonathan Stemeroff. Irrigation Management Strategies for Medical Cannabis in Controlled Environments. Master of Science Thesis. The University of Guelph. November 2017.